Schneider XW+ 6848 grid tie testing? After reviewing the Schneider XW+ install manual (pg 3-30 OR page 78 of 174) looks like I am going to need two separate cables to hook up my Shipping Containerized Solar System to the home I am testing/ commissioning it on and since it is sitting over 100 feet away, 60 amp rated cable is going to get very expensive! I may have to consider moving the Container closer to the home which can be done but is less than ideal since the home is on the side of a mountain and it takes time and money to relocate. My goal is to have any and all excess solar energy generated sent to the home to offset the homes loads, however I do not want the batteries to be used at all, unless of course I manually configure that to happen. 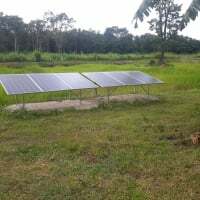 I'll use the Sun to keep the batteries healthy and happy, and also the grid will be there (as there is no generator yet installed) to charge/ equalize batteries every 3 months or as is required if there is no Sun. Since I am only testing the System I don't need it to function fully as a Grid Tied System does and as such am hoping there may be a way to only run 1 cable to the home from the load side of the 60 amp breakers in the PDP. I figure that when I need to top up the batteries in the cloudy winter months I can connect the single line feeding the home to the grid input side of the 60 amp breaker and charge from the grid. Kind of a pain in the but don't yet see why it would not work? I guess the system would be utilized in an "off grid" type situation and I would only use the grid to maintain batteries as necessary. Is it possible to do this without pulling any power from the battery bank and only "sell" or push power to the home when the sun is shinning. I'm sure I will figure all this out as I move forward with this project, but thought I'd post this to gain any insight that may be avail through members with experience with this type of situation. Appreciate the forum and the time members put in. How do you plan on matching the variable load from the house with the variable output from the solar panels? You will need some kind of buffer, be it the grid or batteries. My Outback Skybox is set to non export but it needs a separate connection to the house and a separate connection to the grid to do this. If I remember correctly at first you didn't intend to use the inverter at all to power your home unless the grid went down and only wanted the grid tie for battery charging purposes if the solar wasn't good. Are you now planning to use the solar power to supplement the grid as long as the batteries are not used? In that case you will need 2 cables, one to the grid breaker box and one to the subpanel breaker box. It may take a bit of tinkering with the Grid Support Voltage to get your inverter to only provide power to your home when the sun is strong and not to use your batteries at all to power your home. You'd probably need to set it at about 53v so your batteries can stay in float much of the time. if instead you're only interested in using this inverter to power the home when the grid is down with no intention of supplementing the grid during good sun you can get away with a single cable to the sub panel but would lose the ability to charge the batteries using grid power. You can always run the generator to top off the batteries if the solar isn't enough. You would need a switch like this https://www.lowes.com/pd/Reliance-Panel-Link-7500-Watt-Generator-Transfer-Switch-Kit/4712879 to allow you choose whether the inverter or the grid is powering the house. I'm not an electrician but with a setup like this I don't think you'd need a subpanel; everything would run through the main panel saving on the cost of a sub panel. Instead the switch should allow you to choose whether the grid or the inverter is powering your main panel but you would need to have an electrician wire it. You would lose the inverter's automatic switching feature between the grid and batteries/solar powering your home. a thought... By using that 100 amp switch box with no subpanel you would effectively limit your home to 100 amps when using grid power. Something that may not work well if you have a lot of electrical appliances such as a 4 ton HVAC unit, an electric water heater, and an electric stove. You'd either need a larger switch box or fewer large electric devices..
My home with a well pump easily gets by on less than 60 amps by using mini-splits for AC and some heat along with propane and wood for heat, cooking, ect. Since the 6848 operates in a grid down environment you can get away with using one cable but only if you don't intend to use your solar to supplement the grid and the grid to charge your batteries. Keep in mind that after reaching the subpanel with that 120v the electricity will still need to run another 50+ feet on smaller wire within the walls of your home so I'd use 2% as the max allowable voltage drop on the calculator. In addition if you have grid power running 120' from the house main panel to the inverter PDP and then another 120' to the subpanel in your house it's more like 240' of wire when calculating voltage drop. A side thought. I've noticed that in every home I've lived in the power coming into the breaker box is around 122v. And the power the 6848 inverter puts out is also between 121v and 122v. I assume this is to allow for a bit of power loss as the lines run from the breaker box to the plugs in your walls. For Clarity, the system I have built, in the future, will more than likley be used in an off grid situation, hence the investment into the batteries. However the XW+, and other comparable inverters on the market, are designed to accommodate a wide variety of applications, as I am sure you are aware. Amspter, re: "matching the variable load from the house with the variable output from the solar panels". This is what any top notch grid tie inverter does seamlessly and automatically. Sun or Grid power first ensures batteries are up, which they will be since they are not being used, and then exports all power produced by the solar array to the home/ grid by design, or will operate according to however you set it up. So far it is looking like I may have to have two appropriately sized separate cables, but am still in the "scratching my head stage" as I am sure my electrician is doing as well since this is somewhat new area for him. Re: running power to the home with only 1 cable. This will work, but the problem is, the system needs to go down, if the grid is down, for safety to linesmen and I think it will only function this way with the proper two cable set up as per schematic in the manual. I have for the past while now, been able to use the homes grid power to charge the batteries when low, by simply connecting the cable I have now from the home to the XW+, grid in side, of the 60 amp breaker in the PDP. So, if there was a way to only, safely use 1 cable, I still could use that one cable to also charge batteries from grid when necessary. I would have to first disconnect the home grid connected cable from the load side of the 60 amp breaker in the PDP and connect to the grid in side of the 60 amp breaker in the PDP, as I have been doing up until now. Thank you for the dialogue. Again, any input is appreciated. Amspter, re: "matching the variable load from the house with the variable output from the solar panels". This is what any top notch grid tie inverter does seamlessly and automatically. Just a minor clarification... On the first level of simplification, a GT (Grid Tied, aka Grid Interactive) AC inverter (no battery bank) is quite simple. It takes the power from the solar array (Pmp=Vmp*Imp) and ships it off the grid under the assumptions that Grid voltage and frequency is in specifications, and that the grid has been "stable" for more than 5 minutes. Once those conditions have been met, the GT inverter follows that Irms-grid=Parray/Vrms-grid ... The assumption is that the utility is, for all the world, a giant AC battery bank that holds 244 VRMS (or whatever) no matter the load or the GT current returned to the grid. There is no "voltage or current regulation" requirement (other than MPPT in to GT inverter out running in "current source" mode). There are Voltage Source "GT" AC inverters which are more complex (and gensets that connect to utilty power are also voltage/current/frequency synced too). But we generally do not worry about those here. With Hybrid AC inverters (combined AC GT and Off Grid functions)--They make it look easy, but the interactions are complex and variable. You have have two AC inputs (one grid, the other a backup AC genset), and one AC output (your "protected loads" connection). The AC Input from utility can AC power (run your loads, charge your battery bank), or can output AC power back to the grid (GT mode)--Based on internal programming (batteries need charging, AC loads need energy, etc.). The AC2 Genset input is similar, but will not feed power back to the Genset (usually a big no-no), and will probably have a much wider range of acceptable AC voltage and Frequency. The AC out can draw power from AC1 (utility) or AC2 (genset), may be able to "support" AC output loads greater than the AC2 can output (i.e., 4 kWatt genset + 2 kWatts from batteries to drive a 6 kWatt load), and may also be able to accept "extra" AC power from a Grid Tied AC inverter (use the GT inverter to both support AC loads, feed back to AC1 utility, and charge the DC Battery bank). And you probably have DC power coming in from your Solar Array and Solar Charge controller (which may have communications between the Hybrid inverter and the Solar Charge Controller). Each of these interfaces is subject to monitoring, and of interest to the owner (some want to know the details, other just want the system to "work"). DC power/current/voltage is pretty simple to measure with a precision shunt (power resistor) and a meter to read the voltage drop (current through shunt) and the DC bus voltage. You can monitor the direction of current flow (+ to loads, - to charging battery, etc.). With AC power, it is much more complex. You need to measure the Phase angle between the AC voltage sine wave and the AC current (you can even get into more math for arbitrary waveforms which are pretty common with AC current--Difference between "cheap" and "RMS" (root mean square) reading DMMs. And to measure power (P=V*I*Cosine phase angle or P=V*I*Power-Factor where Cos/PF varies between -1 to 0 to +1; P=I*V) is a big deal too (for accurate AC measurements). The Schneider systems seem to have a very thorough software display available (I have never worked with any of these products) that do a good job of displaying energy flows in the system. And I am sure that there are others with similar (better, not better). And if you want to measure the DC interfaces separately, there are many DC Shunts+Displays that can do that. And if you are specifically measuring energy flow to/from the battery bank, DC Battery Monitoring systems are out there (links are just FYI--Starting points for further research). Battery monitoring is an essential part of your solar power system. Good battery maintainance involves keeping track of your battery levels by using a battery meter or monitor. This will help you to track things like your remaining battery capacity and the time remaining in your battery bank. TED electricity monitor system for residential and commercial sub-metering, solar monitoring, appliance monitoring. Thanks for the clarity! Always take er' to the next level. :) And there always is a next level. Re: "The AC Input from utility can AC power (run your loads, charge your battery bank), or can output AC power back to the grid (GT mode)--Based on internal programming (batteries need charging, AC loads need energy, etc.)." If I am understanding properly, then ONE cable, running from the grid connected Home to my Solar Shipping Container, can both, supply AC power to the "Grid In", 60amp breaker in the PDP, when necessary, (as intended by design), and also, export power back up the same cable when the Sun is shinning.....correct? Is it just that without 2 cables, which would also work as far I can see (1 cable from Home Grid to "Grid Input" breaker in Container PDP and 1 cable from the "Load Side" of the PDP 60 amp breakers feeding back to home/ grid) the system would not be able to take power from the grid and supply power to the grid at the same time? (As electrons cannot flow both ways at the same time) Am I picking up what your putting down or am I still out to lunch? The system is designed to have two cables, but can funtction with one, with limitations...... correct? The usual disclaimer... I am describing the systems in general, not necessarily as XYZ brand/model works. And I am not a solar sales or engineer. First, there is what your utility requires. Most utilities use a single meter.... "Forward", they charge you for electricity. "Backwards" power flow, they credit you (some may simply add or subtract off of your total bill, others may dump the "generated excess" into a separate billing slot to reimburse you). And there are utilities that require two meters. A load meter (your standard home connection). And a power generation meter which is only connected to your GT solar AC inverter output (only "loads", aka power sources). And your utility will total up your loads and sources tell you how much you owe (or get paid). Then there is the hardware. Standard GT inverters only output power to the AC mains (at night, there is may be a few Watts of load). Hybrid AC inverters (typically do off grid and GT power both) usually have an Inverter-Charger function (both hybrid GT/Off Grid inverter and the ability to charge battery bank from AC mains). Generally, this is the AC1 input (AC Mains). Some hybrid inverters may have an AC2 input, which is typically programmed only for use with a generator (wider voltage and frequency specifications allowed--And not allowed to feed energy back to the genset--No GT functionality). Physically, the AC1 and AC2 may be identical hardware, just different configuration assumptions *(and what specific configurations may be allowed by firmware). A hybrid inverter usually connects AC mains to AC1. And you program what you want the hybrid inverter to do (allow/not allow GT energy to be sold back to the grid, maximum AC circuit breaker setting, use AC power to charge battery bank based on time, depth of discharge, time of day, etc.). Can also program (AC1 and/or AC2) limit AC draw from the main/genset (i.e., 30 amps from ACX input, support >60 amp AC output with battery bank and inverter--Generator support mode). Many folks live in areas where their utility does not support GT solar (not legal to feed power back to the grid). It appears that, at least for a couple major brands and models, that if you program no GT and only to pull AC power from the grid when needed (sun set, batteries discharged). However, they find the hybrid inverter may draw upwards of 1-2 amps from utility power any way (2 amps * 240 Volts = 480 Watts). It appears that it is "impossible" to configure a true Zero Amp draw from the grid (unless you turn off the main grid power to the hybrid inverter). Now, say you want to use a GT Inverter (solar panels+batteries) system. You have two places you could connect your GT inverter. 1) is to the AC Mains panel (or even the "generator meter" if required by you utility). Of course, if you lose AC main power (and even if running on genset power), you lose your GT harvest (the GT inverter shuts down for "safety"). Another place you can connect your GT inverter is the AC2 input... Generally reserved for generator and not recommended (or not allowed) to connect your GT inverter. Generally, (smaller, inexpensive) generators do not have +/- 1 Hz frequency control, so the GT inverter will call the AC power "bad". And even if it does sync, it is not "healthy" for the GT inverter to feed power back to the genset. The last place you have AC power is the AC output from the hybrid inverter. It turns out that most (all?) off grid/hybrid inverters can take excess AC power (from GT inverter for example) and feed it "backwards" through the inverter into the battery bank (bi-directional power flow). In the olden days (5-10 years ago? ), most inverters would accept the GT inverter power flow and charge the battery bank to destruction (and/or over voltage shutdown). And you needed to do "something else" to prevent over charging. Today, many hybrid inverters are designed to actually accept and control the charging current (SMA is first/early company to do this, and frequently "better" than others). Basically, Hybrid inverter outputs 60 Hz and GT inverter outputs 100% of output. When battery is full, hybrid inverter outputs +/- 1.x Hz, and GT inverter shuts down (out of frequency range) for 5 minutes/until back in frequency (SMA actually can "throttle" GT inverter output from 0% to 100%, as I understand). So the Hybrid inverter can "actively manage" the output of the GT inverter (or even micro GT inverters) on its AC out (protected loads AC output). It works, has been done. Is it ideal--I would suggest that it would be better to connect your solar array to a standard MPPT solar charge controller (usually same brand) and have it charge the DC battery bank directly. Also remember the hybrid inverter-charger also has an AC1/AC2 charging circuit, and for many folks, AGS (automatic generator starting/control). There is a lot going on here. And detailed understanding of the components, how to program the firmware parameters, and what it is you are trying to do, is all important. The only company (that I am aware of, and I am not in the business) that is heavily using the "Microgrid" concept (distributed loads, hybrid inverters, and GT inverters on one "microgrid") is SMA. Big/strong company+engineering behind that configuration. But you need to contact an SMA reseller (like our host NAWS) and/or or hire a local supplier/install that knows what they are doing. Lots of ways things can go wrong (or break). Remember that a hybrid inverter configured to "sell" to the grid, generally programs the MPPT charge controller(s) (same brand, networked) to output 100% of the available solar power from the solar array(s) to the AC1 main panel power connection. And the hybrid inverter simply starts feeding power "backwards" into the AC mains panel (and utility) if there is more solar power available than the hybrid inverter needs (to charge battery bank, to support loads on its AC output). I hope this is clear/helps. Hybrid inverter-chargers are amazingly complex "animals". The right configuration and programming (some somebody who knows what they are doing)--These things can nearly sing and dance. This corrupted thread has been fixed by Vanilla Support (Thank You!). Do you plan to run the inverter/grid power through a subpanel to feed a limited number of circuits in the house? If not I think you're either going to need to assure that the house never needs over 60 amps. WaterWheel. The home I plan on supplementing, is huge. 400A service , over 6000 sq.feet, and has a average daily draw of around 200 KWH.day. My system can no where near meet the homes demand and was never intended to. I am constructing modest off grid containerized units for the average sized off grid conscious customers home. The electrician is now, thinkikng about how and where to tie in to the homes existing power supply. Still in the desgin stage of hooking up:) May even do an auto transfer switch so that when grid goes down I can still power the homes critical loads only (for a very limited time if no sun shine) without sending power back up the line. Home owner is interested in installing a back up generator so He may be having some electical equipment that can accomdate the future generator and my two systems as well. Kind of a mix up right now but will post what it all shakes down to. The electrician can wire up a number of existing branch circuits, and the homeowner can reconfigure between main power and Aux Power (inverter and/or generator supplied power to transfer switch 2nd input) as their needs change over time. Saves wiring up a separate "protected" subpanel to only a defined set of branch circuits. So are you designing a "self contained" emergency solar power system that you hope to produce in large quantities? And simply testing the first version? I'll make note of all relevant info and discuss with the Electrician. The Self Contained Solar Power Systems (with Gen back up - in the near future - customer decides on gen.) is designed to be an off grid stand alone system to power an average sized off grid home. With the XW+ comes versatility in that it can operate in a wide variety of situations with or without the grid present. I was involved in building one similar off grid unit a few years back now and is still in service and working fine for the company that purchased it. Currently I am building two more larger units now. So I wouldn't classify them as Emergency Back Up units, although you could call them that if you want. More, just an off-grid solar power system. I happen to have the grid present at the site of construction and can take advantage of that when needed. And yes, just commissioning/ testing the units now. I was going to upload a picture but it would not attach. You can see one of the units array in my picture that appears at the top of any of my posts. Going to call Schneider today and see what I can learn through the call center. Bookmarked the link Bill and I'll read up tonight and contribute what I can. Just tried attaching some pics/ snippings (screen shot). Not letting me do it. Called Schneider. Not much help. Usually they are pretty good though. Granted, they can only effectively respond if your question is specific, which mine was not since I'm still piecing this together. "The Conext XW+ will convert externally sourced DC power into AC power for export to the utility grid attached to its AC1 connection (See Figure 1-5, “Converting Excess Available DC power for Export to Utility Grid (AC1) and AC Out” on page 1–6)." AC1 is the Grid In connection in the XW itself and is wired from the bottom of the main 60 amp Grid breaker in the PDP. The top of this same 60 amp breaker in the PDP is where the Main Grid In cable is connected and thus, the "ONE" cable can intact feed either direction and manages anti-islanding by design. Now, I'll ring the sparky in the morning as see where He's at? :) I'll post how we end up hooking it up in the electrical room and the feedback from the inspector. Appreciate the discussion. Really helps! This thread has been repaired. Should be OK to continue posting. Regarding problems posting pictures--It is appears there is/was (fixed?) a bug with .png files being load but .PNG files not. Try using lower case .png and see if it works. Everything in this house including the well pump, mini-split, dishwasher, hair dryer ect. except the electric clothes dryer runs through the subpanel that is powered by the 6848 inverter with a 60 amp breaker in the Schneider PDP. Propane stove and water heater. Never a problem. Keep in mind that my system was originally designed to supplement the grid and sell back to the utility but during the roughly 6 month designing and installing phase the utility (Georgia Power) changed their power purchase program substantially (no longer worth selling to the grid) so when I wired the sub panel I put in lots of circuits such as the 240v mini-split to burn off the excess power we could no longer profitably sell to the grid. 1990's era 2000 sf home with a large 3 car garage and 3 people easily runs off the 60 amp breaker. The 60 amp breaker isn't what defines the power that we use, the battery bank is the defining factor.